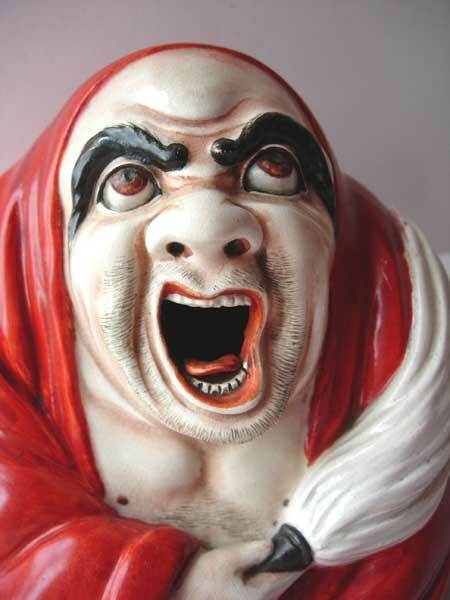 This yawning Daruma is only about 5 cm tall and fits perfectly in the palm of my hand. I got him in Hida Takayama. 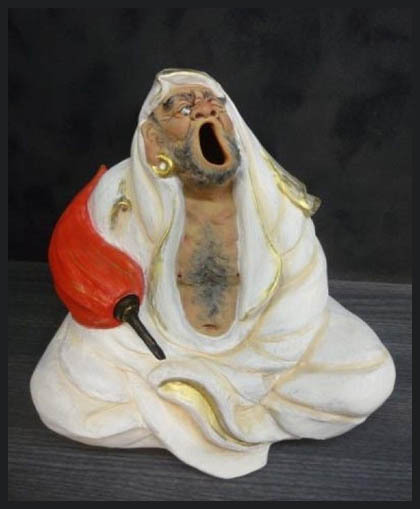 Opening his mouth real wide he reminds me of Daruma Daishi sitting in front of the wall (menpeki kunen 面壁九年) in the temple Suuzan (崇山) in China. arms and back and take a deep breath brings oxygen to your brain and helps your mind to be sharp. 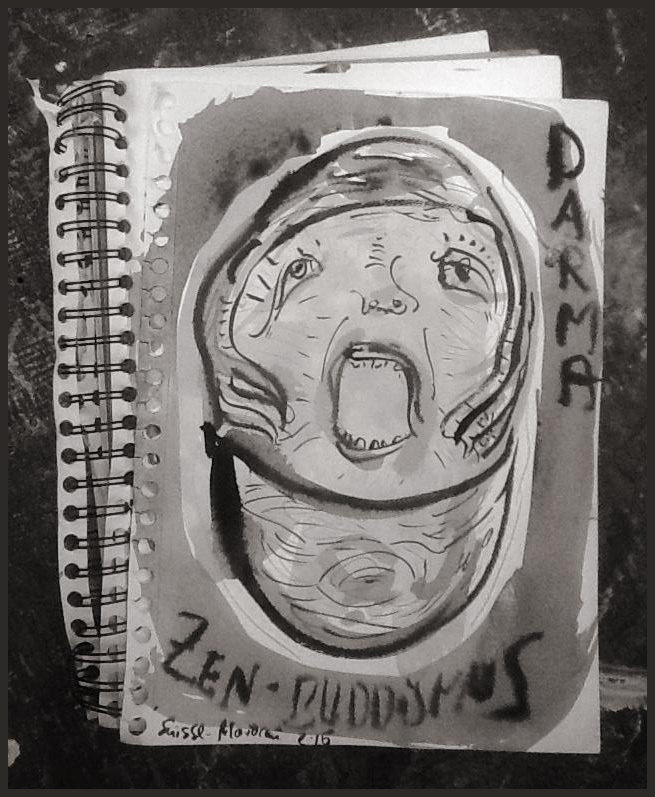 So it is no wonder Daruma during his long periods of meditation took a good yawn once in a while. And just this moment is captured in some of these humorous statues. 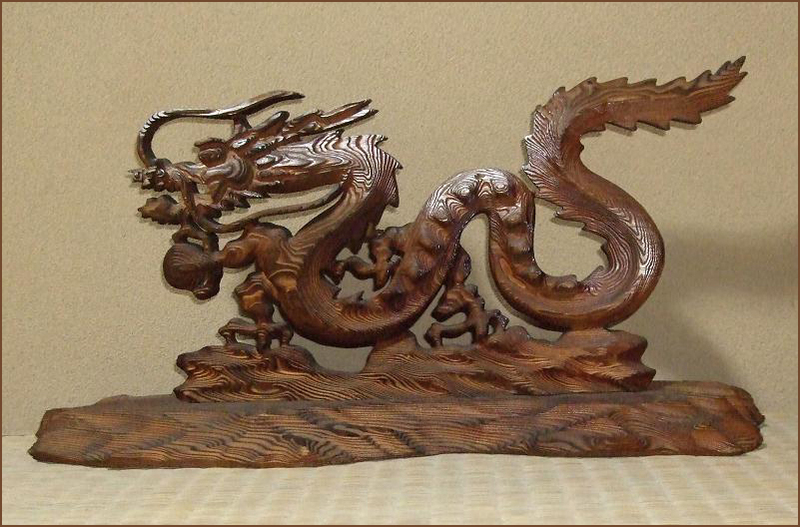 The town Takayama in Gifu Prefecture is well known for woodcarving, especially "with one blade" (ittoobori 一刀彫り). 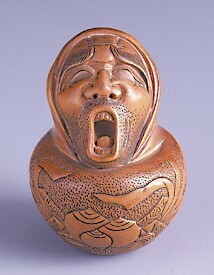 The Yawning Darumas are about 5 to 10 cm high and are a speciality of this area. 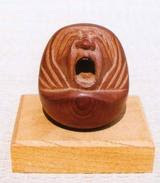 They are part of the tradition of making netsuke (根付) in this area since the Edo period and mostly made of wood from the local Ichi-I tree (一位). Maybe the craftsmen from Takayama went to Edo and took the idea from pictures depicting a yawning Daruma in the Hokusai tradition.
. . . CLICK here for Daruma Photos !
. Gifu Folk Art - 岐阜県　.
. Hida no Takumi 飛騨の匠 Hida’s Master Builders . They are usually in form of little handwarmers (teaburi 手あぶり) and have a big open mouth to put in small pieces of charcoal and sometimes the inside is black with use. Some are made in Kutani. Another type is used as a vase for small flowers. Signed on the base, the carver Gyokuichi is a 19th century netsukeshi recorded in the M.T.Hindson's Collection by Neil K. Davey. As evidence in this series of netsuke, he was greatly influenced by master carver Toen (1820-94), who is famoused for his ningyo/doll combined ittobori style wood netsuke.. 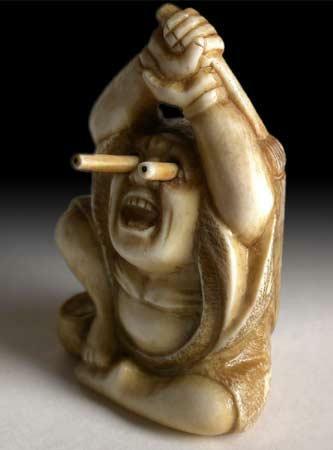 Though Gyokuichi never achieved the status of his master, nerveless, his trick netsuke in ivory were made in many clever ways. His gods and heros are more silly than reverent, and oni more humane than devilish. Throughout the subject matter in this "popping eyes series", Gyokuichi is both bold and wild with a lively sense of humor. His netsuke designs forgo most unnecessary details, but focus on what is tactile and functional. Clearly, his main emphasis is to amuse and produce joy and laughter. 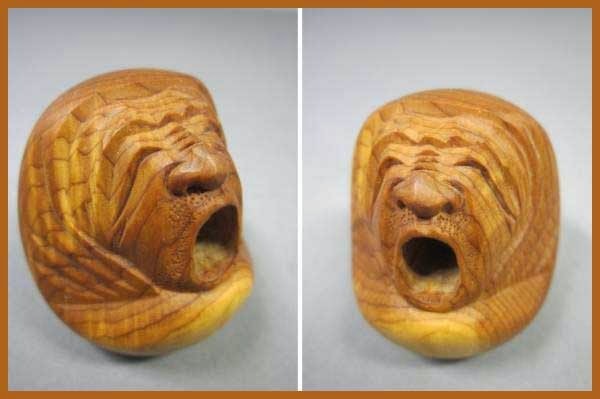 See details of this netsuke in my Netsuke Album, Nr. 42 to 45. Some of these are represented with hands folded unter the robe, others have the hands streched wide above the head. 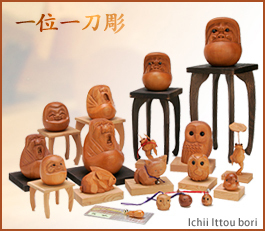 Inahata Clay Dolls (稲畑土人形), which have a long tradition, feature some of these Darumas. They also come as little incense burners or water drippers for calligraphy. 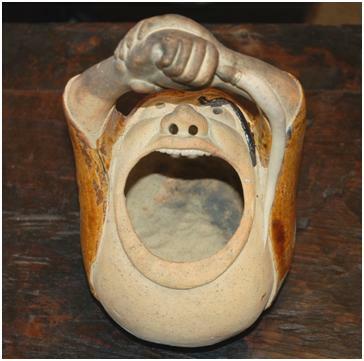 Another type is in the form of an ashtray with Daruma's mouth wide open, made in Kanazawa. Papermachee Darumas (張子) are quite common in Japan, but a Yawning Daruma of this kind seems to be seldom and only produced in Nagoya and Fushimi, Kyoto. This is a little fellow of about 9 cm with a headband (hachimaki 鉢巻), typical of Nagoya. He was made by Katayama Ryuu of Fushimi ward, Kyooto. This doll has the belly protruding and the face looking into the sky, his yawn going right into space. We will talk about Nagoya Papermachee Darumas in a different story. Some of them have little balls of clay inside and make a ratteling noise when you shake them. There is also a little piggy bank with a Yawning Daruma. It is only about 8 cm high and has the characters for "Money saving" on his belly. It is in the tradition of Yano clay dolls (矢野土人形) from Saga Prefecture in Kyushu. But it is too small to put in money, so he is just yawning away waiting to grow. Yano clay dolls are known for piggy banks during the Russian War and were not made much after that. Let us check out Takayama just a little more. It is also called "Little Kyoto" and is well worth a trip. On this HP, you find a general introduction about traveling in Hida Takayama. Or check the following HP in English about local arts and crafts, where some carving of Yewwood (ichi-I 一位) is mentioned. The largest festival,the Sanno Matsuri, which is held April 14th and15th is hosted by the Hie Jinja Shrine. It is popularlyknown as the Takayama Spring Festival. Every Spring,people from all over Japan come to Takayama to celebrate this special festival. After a hot summer when a cool Autumn wind begins to blow, the HachimanMatsuri, held October 9th and 10th, signifies the coming of Autumn. Thus,this festival is called the Takayama Autumn Festival. The Takayama Festivalpopularly refers to these two festivals in Takayama. At last two more pieces from my collection. 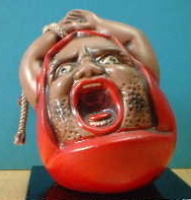 One is an ashtray with an open-mouthed Daruma, his little face quite squashed by the big mouth. He is about 12 cm high and has obviously been in use for quite a while. "Do I have to do all that meditating? Should I take a day off today?" with a really human expression, his little teeth beautifully modeled and the little tounge sticking out. His toes are also quite unique. 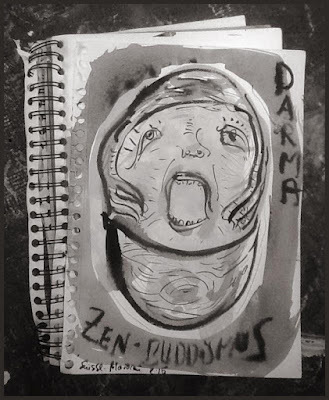 Instead of my portrait, Suiss painted my alter Ego.